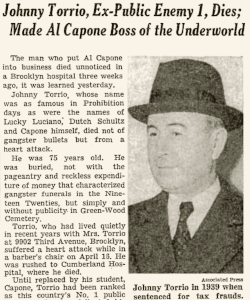 Johnny Torrio, seventy-five-year-old former Chicago underworld boss, died April 16, 1957. His passing was virtually unnoticed. Newspapers were not alerted until about three weeks later, when his will was filed for probate. Raised in the gangs of lower Manhattan's Five Points area, Torrio went west (along with longtime friend and fellow Five Points gangster Rocco "Roxie" Vanella) around 1909-1910. He became bodyguard, enforcer and business manager for Chicago vice lord "Big Jim" Colosimo - possibly a relative of Torrio's step-father Salvatore Caputo. After a while, Torrio brought young Al Capone from Brooklyn to Chicago to assist him. 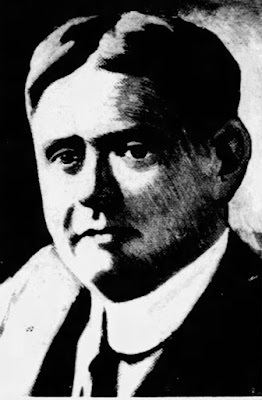 Following Colosimo's 1920 murder, Torrio turned the Colosimo organization into a bootlegging operation and competed with other local gangs and the powerful Chicago Mafia for rackets territory. 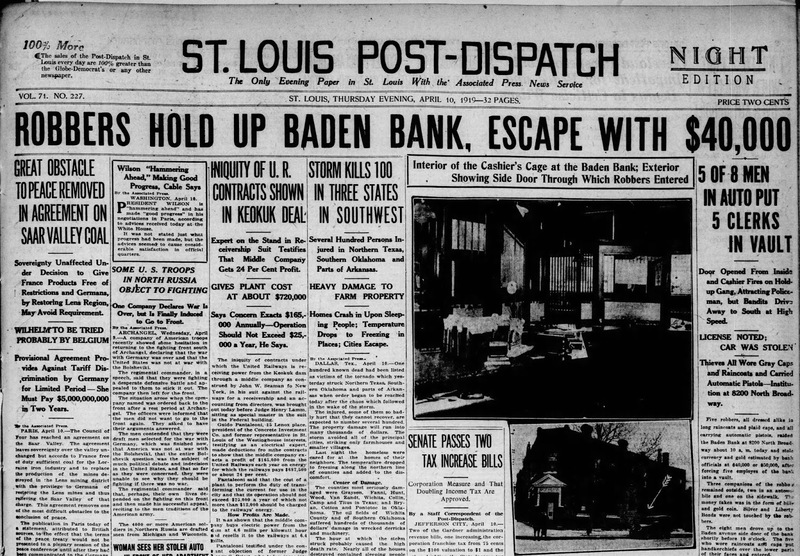 A January 1925 assassination attempt convinced Torrio to retire as gang boss, and he turned his organization over to Capone. Following a jail term at Waukegan, Illinois, for Prohibition violations, Torrio returned to New York. He and his wife settled into a Brooklyn residence, spent winters in St. Petersburg and traveled abroad regularly. Torrio continued his involvement in underworld rackets, repeatedly running into trouble with the authorities. The final decade of his life was spent out of the public eye. His last years were lived quietly in a recently constructed apartment building, 9902 Third Avenue in Brooklyn's Fort Hamilton section. On April 16, 1957, he suffered a heart attack while in a barber's chair and was rushed to Cumberland Hospital (named for its first home on Cumberland Street but located on Auburn Place in 1957). He was pronounced dead at the hospital. He was buried at Greenwood Cemetery. Torrio was survived by his wife of forty years, Anna. U.S. Mafia boss of bosses Giuseppe Masseria was shot to death in a back room at Gerardo Scarpato's Villa Nuova Tammaro restaurant, 2715 West Fifteenth Street, Coney Island. The murder, arranged by Masseria lieutenants including Salvatore "Lucky Luciano" Lucania, concluded the Mafia's Castellammarese War. 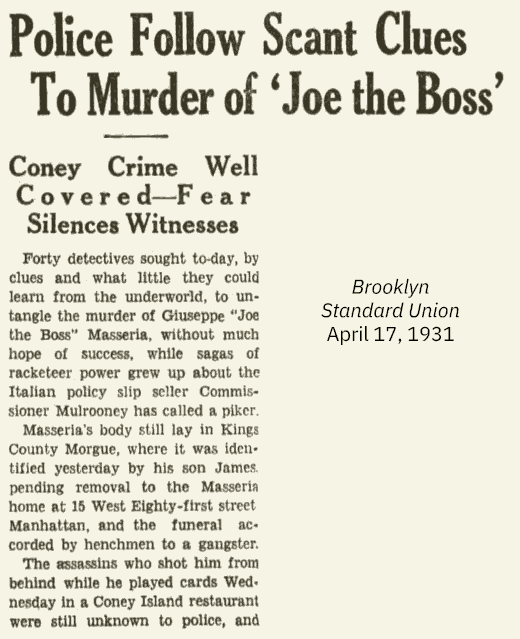 The killing of "Joe the Boss" Masseria was covered by newspapers across the country. But all struggled to make sense of it and many made incorrect assumptions. Lacking precise witness statements, the papers of the New York area presented starkly different accounts of the incident. 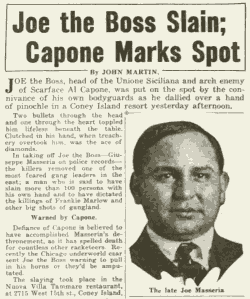 Joe the Boss, head of the Unione Siciliana and arch enemy of Scarface Al Capone, was put on the spot by the connivance of his own bodyguards as he dallied over a hand of pinochle in a Coney Island resort yesterday afternoon. 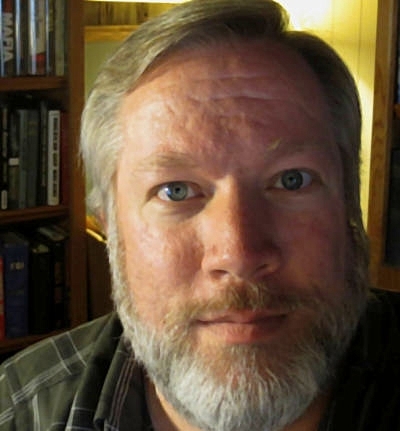 Two bullets through the head and one through the heart toppled him lifeless beneath the table. Clutched in his hand, when treachery overtook him, was the ace of diamonds. In taking off Joe the Boss - Giuseppe Masseria on police records - the killers removed one of the most feared gang leaders in the east; a man who is said to have slain more than 100 persons with his own hand and to have dictated the killings of Frankie Marlow and other big shots of gangland. Defiance of Capone is believed to have accomplished Masseria's dethronement, as it has spelled death for countless other racketeers. Recently the Chicago underworld czar sent Joe the Boss warning to pull in his horns or they'd be amputated. The slaying took place in the Nuova Villa Tammaro restaurant, at 2715 West 15th st., Coney Island, miles from the domain of Joe the Boss, which took in a large section of downtown New York and a slice of Brooklyn. Masseria in addition to controlling the Italian lotteries, was said to have dug in his tentacles so deeply that not a stick of spaghetti was sold in the city without paying him a tax. Masseria was in the place with two of his bodyguards - since the murder of Frankie Yale, one of his henchmen, he had never set foot out of doors without his gunmen - when two dapper young men alighted from a large blue sedan and walked in. They emptied their guns and fled. The bodyguards went, too. So did the proprietors. They went in such haste they left top coats and hats and $40 in bills scattered on the floor. Outside were found two .45 caliber automatics, tossed away by the killers or betrayers. 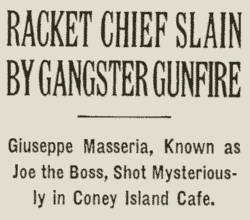 It took ten years and a lot of shooting to kill Giuseppe Masseria - he was Joe the Boss to the underworld - but this enemies found him with his back turned yesterday in Coney Island, and when they walked out into the bright sunshine Masseria's career was ended. There were five bullets in his body. To hear some of the detectives at Police Headquarters tell it, the killing of Joe the Boss is likely to cause an outbreak of gang warfare that will exceed anything this city ever has known. Some of the men who had kept tabs on the racketeer's long career insist that he was "the biggest of 'em all - bigger than Al Capone." It would be hard to tell why Masseria was "put on the spot," according to the police, for his name has been linked with numerous gang murders in the last ten years. And on the east side last night there was much furtive whispering and speculation as to what would follow. Even to his countrymen Joe the Boss was a mysterious power, greater in strength than many whose names appeared more often in the daily newspapers. At 1 P.M. yesterday Masseria drove is steel-armored sedan, a massive car with plate glass an inch thick in all its windows, to a garage near the Nuova Villa Tammaro at 2,715 West Fifteenth Street, Coney Island, and parked it. Then he went to the restaurant. What happened after that the police have been unable to learn definitely. Whether he met several men in the restaurant or whether he was alone when he went into the place, is uncertain. Gerardo Scarpato, the owner, said he was out for a walk at the time and his mother-in-law, Mrs. Anna Tammaro, said she was in the kitchen. At 2 o'clock the quiet of the little street near the bay was broken by the roar of gunfire and two or three men walked out of the restaurant to an automobile parked at the curb and drove away. When the police got there they found Mrs. Tammaro bending over the body of Joe the Boss. He lay on his back. In his left hand was clutched a brand new ace of diamonds. Four hours after the shooting the automobile in which Masseria's murderers escaped was found abandoned at West First Street, near Kings Highway, Brooklyn, about two miles from the Nuova Villa Tammaro. On the back seat were three pistols. One lacked two cartridges; another had discharged one cartridge recently,a nd the third was fully loaded. Two other revolvers were found in the alley that runs along one side of the restaurant. A violent gang war was predicted in New York as the aftermath of the killing of Guiseppe Masseria, known as "Joe the Boss." He was said by police to be an ally of Al Capone and worked with the Chicago gang leader in the liquor business, racketeering and gambling. Masseria was shot to death in a Coney Island cafe by two well-dressed young men who calmly walked into the restaurant and began shooting. They fired twenty shots and five struck Masseria - all in the back. He was found dead near an overturned card table. The killers walked leisurely out of the cafe and escaped in an automobile. Although fifty detectives surrounded the cafe shortly after the shooting, they uncovered no clews at the identity of the slayers. 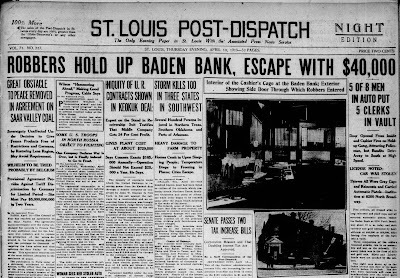 An armored steel car, equipped with bulletproof glass an inch thick, in which "Joe the Boss" was said to have traveled to protect him from many enemies, was found near the scene of the shooting. Police said they believed three of the Masseria gang, who had been with their chief in the cafe, might have hired the two young men to kill Masseria. Brooklyn detectives were rushed to Jersey City shortly before noon, where a suspect had been taken into custody in connection with the slaying yesterday of Giuseppe (Joe the Boss) Masseria, big shot racketeer. According to information from the New Jersey authorities, they had seized Anthony Devers, 31, after he had given an erroneous Jersey City address. 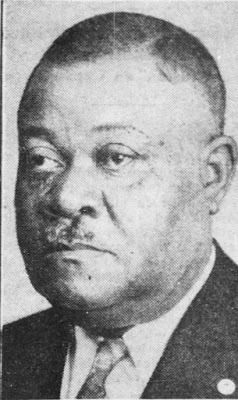 Devers was arrested on the State highway on suspicion. He was driving a car owned by Charles Starapata, of 2715 W. 15th St., Coney Island, the address of the Nuova Villa Tammara, where Masseria was slain. The slaying of Masseria led the police to take steps to prevent, if possible, the worst gang war in the city's history which they fear will follow the "rubbing out" of Masseria. 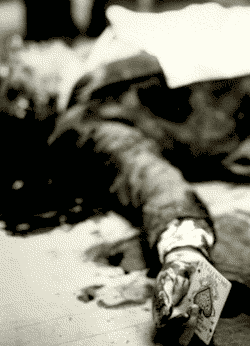 When Police Commissioner Mulrooney was asked about the shooting he declined to admit that the dead man was an underworld big shot or that he ever had heard he was the arch enemy of Al Capone, Chicago's Public Enemy No. 1. "Did you know that several Chicago gunmen are known to be in Brooklyn and are supposed to have done the shooting?" "No, I do not," Mulrooney replied. "Have you learned any reason for the shooting?" "No. But we have detectives making an extensive investigation." Joe the Boss was far from his usual haunts when three slugs wrote finis to his 11 years of criminal activity. ...Masseria was playing cards in the back room of the Nuova Villa Tammara with three other men at 3 o'clock yesterday afternoon when a blue sedan drove up to the door and two men leaped out. Walking directly through the restaurant, the men disappeard into the rear room. Instantly there came the sounds of several shots. Leaving by a side door and throwing their weapons away, the men entered their machine and disappeared. 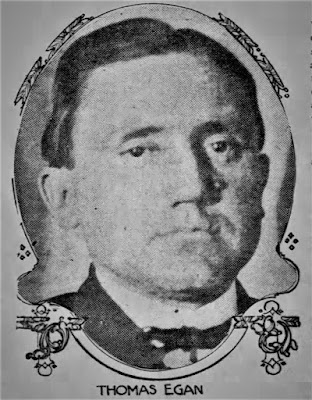 One of the officers of the Union Siciliano, an organization of Sicilians, Masseria was the king of the wine, fish and beer rackets, his domain including a large portion of the east side of Manhattan and a part of Brooklyn. The reign of this underworld chieftain began in 1920, when he graduated from burglary and assault into the policy racket. In his day he had control of practically every purveyor of Italian food in the city, demanding and receiving tribute from wholesaler and shopkeeper alike. Forty detectives sought to-day, by clues and what little they could learn from the underworld, to untangle the murder of Giuseppe "Joe the Boss" Masseria, without much hope of success, while sagas of racketeer power grew up about the Italian policy slip seller Commissioner Mulrooney has called a piker. Masseria's body still lay in Kings County Morgue, where it was identified yesterday by his son James, pending removal to the Masseria home at 15 West Eighty-first street, Manhattan, and the funeral accorded by henchmen to a gangster. The assassins who shot him from behind while he played cards Wednesday in a Coney Island restaurant were still unknown to police, and shielded by the frightened silence of all who might know anything about them. Acting Capt. John J. Lyons of Coney Island station questioned a half dozen local racketeers brought before him yesterday, without tangible results. Police Department fingerprint experts have gone over Masseria's armor plated car, which he parked near where he was killed. The rumors about "Joe the Boss" continue to grow. 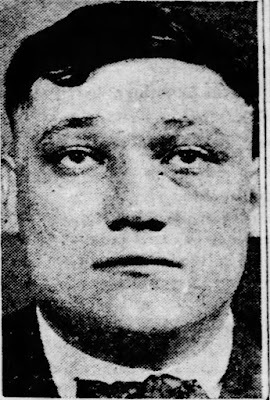 Chicago gangsters of Capone ambushed him, one had it, because he was muscling into Brooklyn racket territory from his own bailiwick, the Bronx. Another had it he was taken by Al Wagner's gang on the East Side, over an insult from one of his followers to the wife of one of the Wagner gang. But "Joe the Boss" was, Commissioner Mulrooney insisted, a piker. It is interesting that several accounts reported that Masseria's hand was holding a playing card when police reached the murder scene. The newspapers stated that the card was the Ace of Diamonds. A famous photograph of the scene, however, clearly showed an Ace of Spades card in Masseria's hand (at right). It has long been rumored that the photographer placed the legendary "death card" in Joe the Boss's hand before snapping the picture. Crime figure Amadeo Buonomo was buried April 9, 1913, in Queens, New York. He died of a gunshot wound on April 6, a casualty of the 1910s underworld warfare in East Harlem. - Giosue Gallucci, cafe owner and lottery racketeer, who was regarded as the "king" of Harlem's Little Italy until his reign was ended by bullets in May 1915. Buonomo stood out from the group due to his unusual wardrobe. 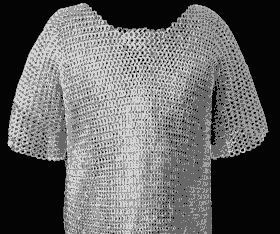 It was said that, after becoming involved in the gang war, about the time of Prisco's December 1912 death, he generally wore a chain mail hauberk beneath his clothes to protect against the blades of his enemies. As a Prisco disciple who swore to avenge the Neapolitan gang boss's killing, he had plenty of enemies. According to published reports, the twenty-seven-year-old Buonomo was not wearing his protective chain mail one evening in early April (the reports suggest it was April 3), as he started down a stairway to a basement wine shop at 113th Street near First Avenue. But it probably would not have afforded him much protection on this occasion, as his attacker opted to use a handgun rather than a knife. A bullet fired at close range entered his neck. Friends rushed Buonomo to Harlem Hospital, where he lingered for days before succumbing. There were a number of rumors relating to statements he made on his deathbed, but it is unlikely that Buonomo was able to say very much. According to the autopsy, the bullet wound caused internal bleeding into his throat, and Buonomo eventually asphyxiated, drowned by his own blood. His April 9 funeral, directed by the Paladino and Pantozzi firm of East 115th Street, was an East Harlem spectacle. The hearse, drawn by six white horses, was followed by one hundred carriages of mourners and a forty-two-piece marching band. Buonomo was buried at Calvary Cemetery in Queens. 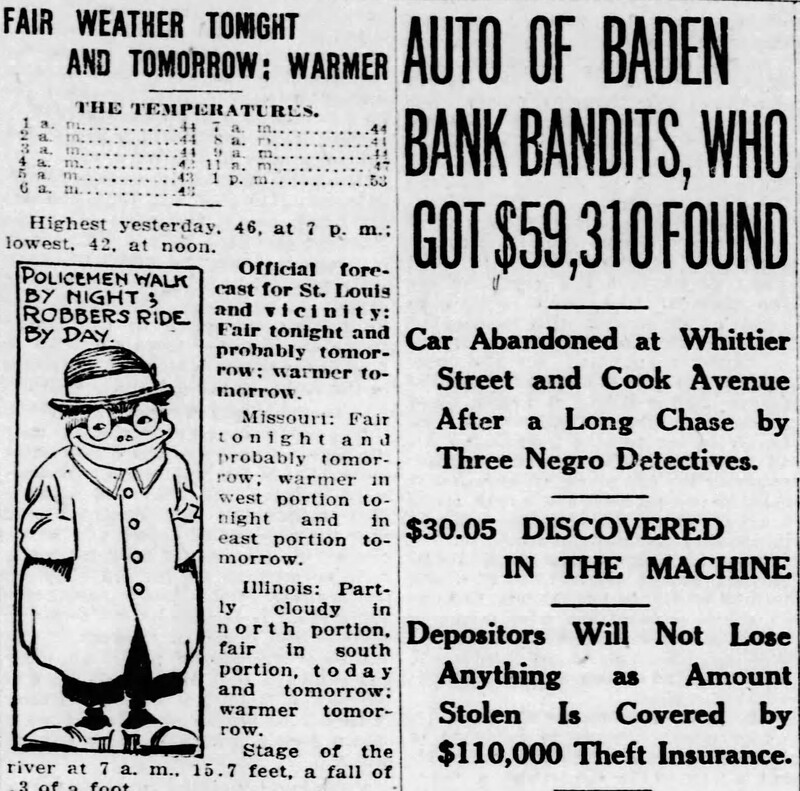 "Buonomo pays for killing," Bridgeport CT Evening Farmer, June 30, 1914, p. 1. "Coats of mail still in use," Buffalo Enquirer, Oct. 27, 1913, p. 4. 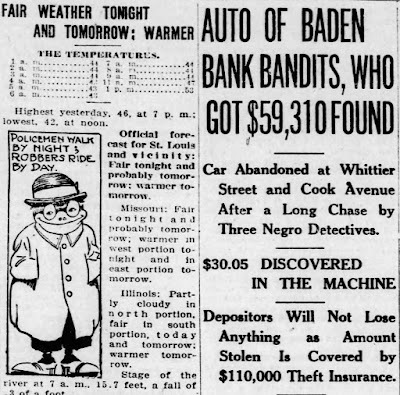 "East Side gunmen take second victim," New York Tribune, April 30, 1913, p. 5. "Feudists' bullets avenge slaying of gunman in Harlem," New York Evening World, April 11, 1913, p. 10. "Two more Italians shot," New York Sun, April 18, 1913, p. 5. "White slave's' life here," New York Tribune, Oct. 29, 1912, p. 7. Amadeo Buonomo Certificate of Death, registered no. 11224, Department of Health of the City of New York, date of death April 6, 1913. Critchley, David, The Origin of Organized Crime in America: The New York City Mafia, 1891-1931, New York: Routledge, 2009, p. 110-111. New York City Death Index, certificate no. 11224. Thomas, Rowland, "The rise and fall of Little Italy's king," Pittsburgh Press, Dec. 12, 1915, Sunday Magazine p. 4.